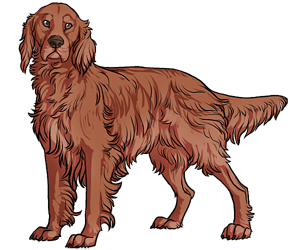 Setters have been recorded as early as the 1500s, but the Irish Setter began to develop in Ireland in the early 18th century. The Irish setter started out white with red spots and shorter legs due to their use in setting game. By the 19th century the dog had been bred to be a pure chestnut red color. With the introduction of guns in to hunting, the Irish Setter developed into more of a gun dog with longer legs and different hunting styles than the original setter. 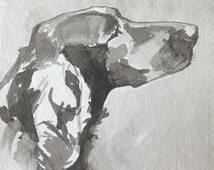 The breed was recognized by the AKC in 1878. Today the breed excels in hunting and makes a good family pet. When the Irish Setter was originally created, they were bred to lay down beside birds so that the hunter could throw the net over the dog and the birds. The Irish Setter likely came before the English Setter. The breed standard for the Irish Setter has remained virtually unchanged since 1886.